Getting started with Life's Abundance Easy. Click Here and then click on the Red Sign Up Button. You can join as either a Basic Field Rep or as an Executive Field Rep. Statistics show that Executive Field Reps are more successful than basic Field Reps. Becoming an Executive Field Rep is easy. Just choose one of the 3 Executive Field Representative sign-up options. 1. 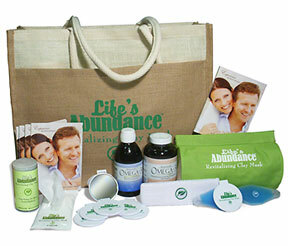 Basic Field Rep - $29.95 - You receive the Life's Abundance Start Up Kit which includes your FREE Personal Web Site for 1 Month, Selling, Recruiting and Training DVD's, Product Catalogs and Product Price Lists, The Life's Abundance Opportunity Presentation, Compensation Overview and All Necessary Forms. Lastly, fill out your information and choose your Life's Abundance website name. Your Life's Abundance website looks like this - www.LifesAbundance.com/YOUR_CHOSEN_NAME - Your website will be "live" in just a few minutes and your customers can start placing their orders. Please note that starting in the 2nd month your website is just $10.95. Your Life's Abundance website is coded to you. Your customers place their orders, you receive a copy via email and the company ships the order to your customer. Your web site becomes your personal store front and training area. After you join, you will have access to our team calls, training website and online group for questions. The company holds a call every Tuesday and Dr Jane Bicks, our product formulator and holistic veterinarian, a hosts Q&A conference calls. Please feel free to contact us with any questions - we are here to help you. We provide an array of superior quality, safe and effective products that are inspired by nature, informed by science, and born of a commitment to improving the health of people, pets and the planet. Our pets are special and we are committed to providing our special friends with high quality health foods, effective nutritional solutions and supplements, treats with a healthy purpose, and luxurious pet care products created to beautify and pamper your pup. You will be proud to offer our exclusive line of products to your customers. There’s no better way to start your feline’s lifetime of health on the right paw than with the Life’s Abundance Healthy Start Pack for Cats. Premium care for your cat begins with one 6.6 lb. bag of Life’s Abundance Premium Health Food for Kittens & Adult Cats, one bottle of Wellness Food Supplement for Cats, one 4 oz. bag of Gourmet Cat Treats for Healthy Skin & Coat and one 32 oz. bottle of BioDeodorizer to eliminate litter box odors. The purchase of this pack saves you 15% off the regular Retail price and 13% off the regular Autoship price when items are purchased individually. Fortifying the Diet for Long-Term HealthYou want to ensure the well-being of your canine companion. But it may not be a simple matter to determine which nutrients are required for optimal health. Working with our veterinarian product formulator, Dr. Jane Bicks, we have developed three unique formulas to target specific needs: Agility for healthy joints, Skin & Coat for healthy skin and a glossy coat, and Wellness Food Supplement for Dogs for overall health. A comprehensive nutritional supplement, the new and improved Skin & Coat Formula for Dogs and Cats addresses skin and coat health in a holistic way. Unlike ordinary skin and coat supplements that contain fatty acids and a few other ingredients, this formula supplies a whole host of additional nutrients that work together to address the complex factors that play a role in supporting skin and coat health. The nutrients featured in this formula can yield several health-promoting benefits. If your companion animal’s skin or coat is less than perfect, try a bottle of the new-and-improved Skin & Coat Formula with a comprehensive line-up of nutrients that work together to help support healthy skin and a shiny coat. Few things bring more enjoyment to your dog than the reward of a treat. And it makes us feel good, too. The very act of giving a treat helps to solidify the bond that we share with our canine companions.Unfortunately, many of the canine snacks available on the market today are non-nutritive “junk foods”, that could be harmful to your dog’s health. It’s important to remember that even if you feed your dog a diet of healthy food, “junk food” treats could have a significant negative impact on his or her health. Thankfully, you don’t have to abandon this great way to reward your dog. There’s no reason treats can’t be nutritious and tasty. At Life's Abundance, we approach our baked treats differently than our competitors. When we formulate our baked cookies, we treat them as important vehicles for nutrition and pleasure. You have our guarantee – we do not create pet products simply on measures of taste or texture. This is a wholly unique approach in the pet product industry. Few things bring your dog more enjoyment that chewing on a tasty treat. And yet, every year, untold numbers of dogs suffer from a variety of digestive issues as a result of consuming rawhide. Not only that, but frequently rawhide is preserved with harmful chemicals. That’s why we developed a line of chew treats made using pork products, which are much easier on your dog’s entire digestive system and are free from potentially harmful chemicals. Our pork treats are guaranteed to be not only safe, but incomparably appetizing to your sweet pup as well. Whether you have a Chihuahua or a Great Dane, there’s a pork treat made just for their size. So, say “goodbye” to traditional chew products, and give your dog something he or she can really enjoy – safely! Dogs can’t resist the rich aroma of our delicious pig snouts. Packed with high-quality protein, Porky Puffs chewable treats are non-greasy and contain no chemical preservatives or flavors. And with no artificial colors, you won’t have to worry about hard-to-remove stains in your carpet! They are easily digestible and therefore a safe alternative to rawhide, which can cause choking, throat irritations and potentially dangerous intestinal blockages. Cleans ears and eliminates odor, dissolves ear wax and removes dirt and debris by bringing it to the surface. Ear Care Formula dries the ear but don't worry, there's no alcohol. It also soothes the ear during application and long after. For a decade, Life's Abundance has provided high-quality, safe and effective products to improve the health of people everywhere. And our products continue to make a profound impact on the lives of many people throughout the United States. Currently, we offer two innovative product lines that are effective in promoting health and vitality. Each line is the result of ground-breaking medical research and each is scientifically formulated to foster health and wellness. Life’s Abundance Revitalizing Clay Mask is an ultra-absorbent Volcanic Ash Clay formula. When applied to the skin’s surface, this soothing clay firms and exfoliates, resulting in a revitalized and more youthful-looking complexion! Sealogix, our signature line of pharmaceutical-grade fish oil supplements, is manufactured to the highest international standards for purity, quality and concentration. These product lines have demonstrated a truly positive benefit for countless individuals and families. 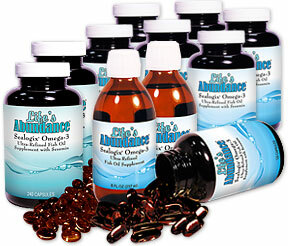 And now, we invite you to discover the positive power of Life's Abundance products. Did you know that simply by taking a couple of small steps to protect the planet, you can also help to ensure the health of your family? Our signature line of environmentally-friendly cleaning products is a more natural alternative to harsh conventional cleaning product lines, which often contain chemicals that can negatively impact the air quality of your home and the long-term quality of our water supply. Although our cleaning products are industrial-strength, they are safe for use in the home. Additionally, these products represent the latest in microbial technology, with friendly bacteria that eliminate the organic wastes that cause odor, rather than just masking the smell. We’ve also adopted a new strategy to reduce the amount of plastic waste entering our already overburdened landfills. We use plastic containers that are very dense, so they can be used over and over again. Additionally, our superior-grade sprayer nozzles are built to last, enduring repeated use. If you’re looking for environmentally-friendly cleaning products that are pet-safe, child-safe and effective, look no further! Become a Life's Abundance Distributor Today!